The Crescent City Lodge of the Fraternal Order of Police represents 1,145 active police officers on the New Orleans Police Department. The vast majority of those officers were not part of the past or current administration. The vast majority of those officers have never been in trouble. The overwhelming majority of those officers are dedicated, hard-working public servants who are devoted to improving the quality of life in the city of New Orleans. It is easy to paint everyone with a broad brush, but it simply isn’t fair. These same dedicated public servants have a vested interest in improving the NOPD and its relationship with the community. They also have ideas about how that might be accomplished. The Justice Department may have some ideas about how things should go, but it is obvious that they do not have it all figured out. Recent events have shown that members of the Justice Department are not immune from acting based on prejudice. The process of reform must be embraced from within. The men and women of the NOPD strive to represent the city of New Orleans positively every day. They would like to be able to contribute to the reform effort. The days of hyperbole like the “aorta of corruption” need to end. The public deserves to be treated better than to have someone bent on exaggerating the truth and deepening the divide making up sensational accusations in the hope those absurd allegations will be repeated on every television station. All hope is not lost. 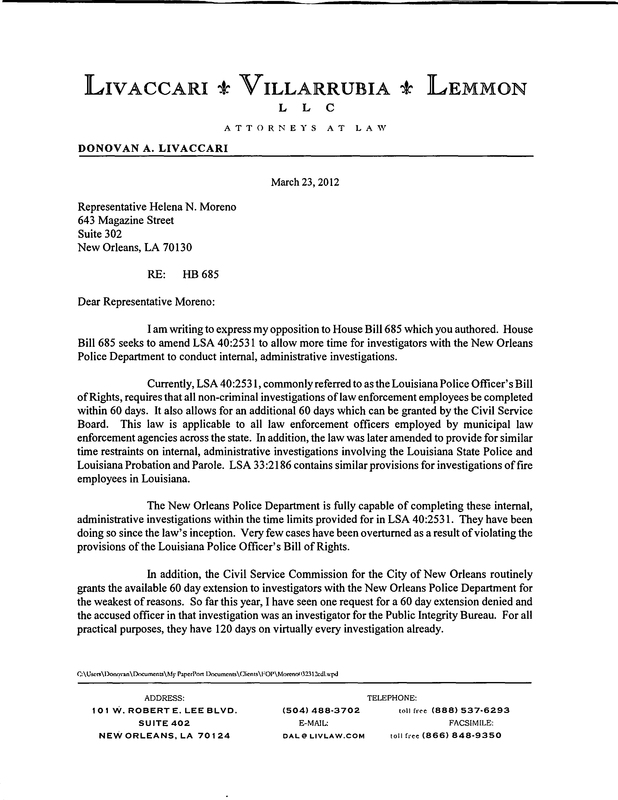 The New Orleans Police Department does not suffer any problems that are not present in other police departments. 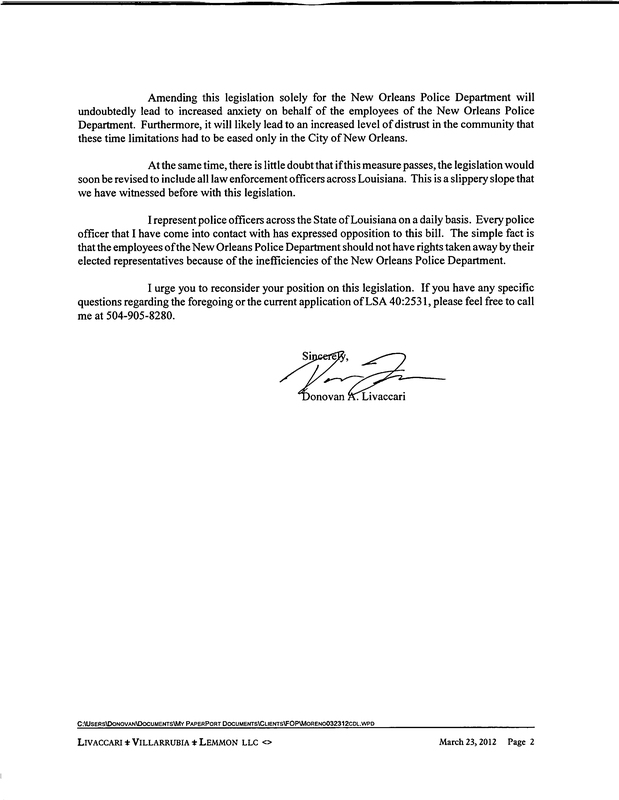 Given the proper mandate from the Mayor, the NOPD is perfectly capable of reform. 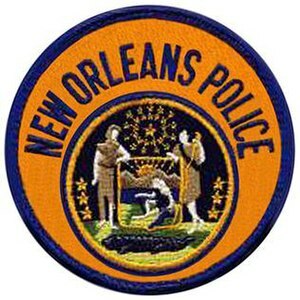 The current leadership has demonstrated a desire to change the culture within the NOPD. While the FOP hasn’t agreed with every one of those decisions, there is no denying that change is afoot. This consent decree is going to cost the city of New Orleans millions of dollars. These are millions of dollars that this city doesn’t have. Frankly, we should embrace the dedicated offices and their ideas before agreeing to a consent decree that will cost us millions of dollars and only result in changes already being implemented being ordered by a judge. At the very least the dedicated officers should have a voice in the ongoing negotiations. It should be a voice they recognize. The FOP can provide that voice for them and the citizens of our city. George Bourgeois, a long-time FOP member, has been diagnosed with Acute Myeloid Leukemia and needs our help. Brother Bourgeois, who received his law degree while working at NOPD, retired as a Police Captain, and has been working as an Assistant District Attorney on Leon Cannizzaro’s staff. In a recent email George informs us that he has received 20 units of blood and platelets, and there will be more transfusions in his future. Overall, George says he is feeling good and his treatments are going better than expected. A blood replacement drive has been arranged for Thursday, March 22, 2012, from 9AM-3PM, at One Shell Square (see attached flyer). We urge all of our members to get over there and assist our brother in his time of need. The New Orleans Blood Center will also accept donations at any local Blood Center. Call (504) 887-2833to make an appointment. Make sure you let them know the donation is for “George Bourgeois of Metairie”. Most importantly, lets all of us keep George and his family in our thoughts and in our prayers. 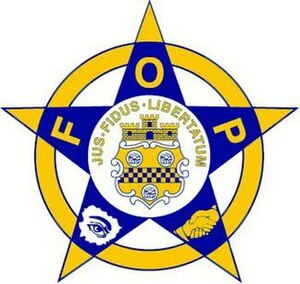 Fraternal Order of Police wants in on NOPD consent decree negotiations; says process tainted by Perricone scandal | NOLA.com. On the Internet, silence cannot be misquoted. Would you be okay with Dave from human resources regularly monitoring your Facebook account? We have all known for some time that employers routinely check information publicly available on the Internet about current and potential employees as part of background checks and other employment decisions. Somehow, we’re okay with that because it is already out there. But, did you know that some employers are requiring greater or complete access to your private online accounts (e.g., Facebook) to either continue employment or to get hired? I am not so sure about this guy’s position on recording interviews, but it is interesting reading nonetheless. Thanks to Lou Gaydosh for passing this along. Police attorney offers best practices tips to civil rights overseers.